The PCI-441 Single Channel Digital Oscilloscope and the PCI-442 Dual Channel Digital Oscilloscope have a maximum sample rate of 40 MSPS, a 20 MHz Bandwidth, and 10 bits of resolution, and they fit in one ISA expansion slot. 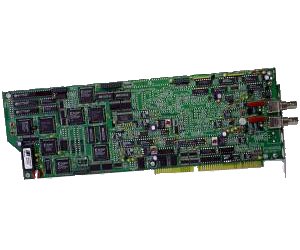 Whether in an oscilloscope application, or a data acquisition application, the PCI-441 and the PCI-442 provide high performance in a small package at a reasonable price. Other benefits of these oscilloscopes include a 64 kSample waveform memory, burst mode, seven voltage ranges from 2V/div down to 20 mV/div (other choices are available), offset control, AC/DC coupling, external sample clock and an internal clock circuit that utilizes advanced Direct Digital Synthesis technology.